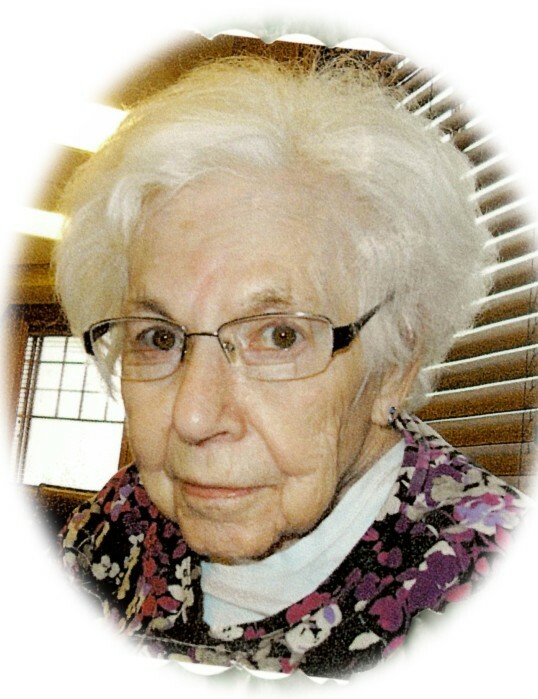 Dorothy Hellman, 92, Mandan, passed away on Jan. 24, 2019 at Sunset – a Prospera Community. A funeral service will be held on Monday, Jan. 28, at 10:00 AM at Weigel Funeral Home with Deacon Bob Wingenbach officiating. Burial will be held at Mandan Union Cemetery. Visitation will be held on Sunday from 4:00-6:00 PM at Weigel Funeral Home, Mandan with a Rosary/Parish Vigil at 6PM. Visitation will continue one hour prior to the service on Monday. Dorothy was born on December 18, 1926 to Nick and Monica (Eckroth) Ressler in Mandan, ND. On April 5, 1948 she married Frank Hellman at St. Joseph Catholic Church. Dorothy and Frank were married for 56 years at the time of Frank’s death. Dorothy and Frank were blessed with eight children. Dorothy was a stay at home mom until the children were all in school. She then began working as a cook for Mandan Public Schools. Dorothy cooked for the children at Lewis and Clark and Roosevelt Elementary Schools as well as Mandan High School. The children and coworkers at the schools were a cherished part of her life. Dorothy enjoyed welcoming family and friends into their home. Hot coffee and fresh bakery were always on hand for guests. Whenever possible she enjoyed 8 to 10 card bingo and was known by some as “Bingo Dot”. Dorothy also liked playing many different card games and watching television game shows. Time she shared with her children, grandchildren and great grandchildren were precious to her. Dorothy’s contagious smile and the twinkle in her eyes shall always be remembered by all. We would like to express our extreme appreciation and gratitude to Dorothy’s wonderful caregivers at Sunset-Prospera who truly became members of our family. She loved you more than you know. Thank you. She is survived by three daughters, Patricia (Wayne) Kruckenberg, Mary (Tom) Palanuk, Pudge (Craig) Sjoberg, all of Mandan; four sons, Thomas (Karla) Hellman, Mandan, Mike (Robin) Hellman, Fargo, Dan Hellman, Ft. Lauderdale, FL and Bill Hellman, Mandan; 8 grandchildren; Kathy (Mike) Santjer, Rugby, Josie (Wayne) Keeler, Mandan, Thomas Palanuk Minneapolis, MN ,Jesse (Kayla) Sjoberg, Mandan, Janaye (Evan) St Michel, Bottineau, Taylor (Atlanta) Hellman, Mandan, Jace (Abby) Hellman, Boise, ID and Kaylie Kahl, Bismarck and 6 great grandchildren; Marly and Avery Santjer, Addison and Lincoln Sjoberg, Kloe Kahl, and Charlotte St. Michel; two sisters, Kathy (Richard)John, Fergus Falls, MN, Adeline (Wendel) Castleberry, Keystone Heights, FL; six brothers, Joe (Colleen) Ressler, John (Paulette) Ressler, Ed (Violet) Ressler, Nick (Nadine) Ressler, all of Mandan, Clarence Ressler, San Gabriel, CA and Paul Ressler, San Diego, CA; and numerous nieces and nephews. She was preceded in death by her husband, Frank; her parents, Nick and Monica; son, Timothy; sisters, Mary Ann Ressler and Ida Bohl; brother, Christ Ressler. Please go to Dorothy's Tribute Wall to sign the online guestbook or to share memories with her family.